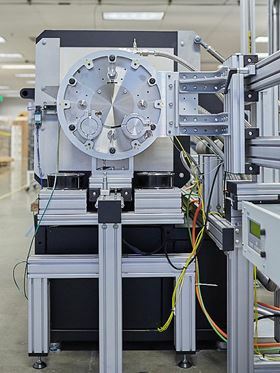 Manufacturing equipment for Sila Nanotechnologies’ Si-dominant composite anode material. 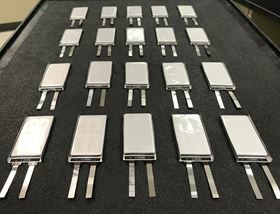 Sila Nanotechnologies’ Si-dominant composite anode cells. Lithium-ion batteries are now the preferred power source for portable electronic devices such as cell phones and tablets, as well as electric vehicles and even grid-scale energy storage. But although there has been steady progress on improving energy density and reducing costs over the twenty years since Sony introduced the first Li-ion battery in 1991, the technology is starting to reach its physical limits. The basic construction of Li-ion cells is the same whether they are intended for consumer electronics or electric vehicles. An anode, separator, and cathode are immersed in an electrolyte solution, which facilitates the transport of Li ions between the cathode and the anode. Cells for electronic devices typically have a graphite anode and lithium cobalt (LCO) cathode, while those destined for electric vehicles have the same anode combined with a lithium nickel cobalt manganese (NCM) or lithium nickel cobalt aluminum (NCA) cathode. Adding other metals to the cathode allows a reduction in the amount of cobalt used, which is both expensive and toxic, at the expense of only a slight reduction in energy density. The problem, however, as Gleb Yushin, professor of Materials Science and Engineering at Georgia Institute of Technology, points out is that the energy density improvements and price reduction have plateaued in recent years. “For affordable electric vehicles, we still need substantial cost reductions, while for smarter electronic devices we need smaller and better performing batteries. However, conventional Li-ion cells are approaching their practical limits and cannot provide such features,” he says. The main limiting factor is the graphite anode, which is currently operating at near its theoretical capacity. The alternatives are limited by the periodic table: only silicon or lithium-metal has the potential to provide significantly higher capacity anodes. While both materials have their own inherent challenges, Li-metal anodes tend to suffer from slow charging rates, poor low temperature performance, and large volume changes during cycling, as well as safety-related issues. Yushin believes that Si anodes, which have the potential for fast charging and excellent low-temperature performance, are a better bet. Si-containing additives, which are being developed and produced by various companies including Shinetsu Chemical, startups Angstrom Materials and its sister company Nanotek Instruments, OneD Material and others, are already being introduced in small amounts (typically up to 3-5%) into commercial graphite anodes to boost performance by some manufacturers like Panasonic. While a promising step forward, something more radical is needed to deliver a dramatic improvement in battery performance. With this in mind, Yushin co-founded Sila Nanotechnologies in 2011 to develop and manufacture advanced Si electrodes. The 100-employee strong, Silicon Valley-based company has developed a nanoporous Si-dominant composite that could replace current graphite anodes completely. The key advantage of this material is its porous structure. When anodes take on Li-ions during charging, in a process known as intercalation, there is a corresponding volume change, which can lead to problems. While graphite can accommodate one Li atom per six C atoms, Si anodes can store up to 20 Li atoms per six Si atoms – but with a large expansion in volume. The internal pores of Sila’s Si-dominant composite anode material can accommodate this volume expansion during charging with little impact on the outer dimensions of the cell. Moreover, the material is produced in power form in large volume reactors, which can be easily scaled up, and is fully compatible with current battery manufacturing equipment used to produce graphite anodes. “In realistic cells, Si anodes may offer up to 40-45% more energy together with an increased charging rate, which is important for both electronic devices and electric cars,” says Yushin. Initially, however, Sila’s Si-dominant anode will provide a more modest 20-25% energy boost. Further improvements are on the horizon, however, and the company hopes to see the fruits of its long-running partnership with carmaker BMW rolled out for next-generation electric vehicles by the early 2020s. UK-based startup Nexeon is also focusing on primarily Si-anodes for electric vehicles, while California-based Enovix in partnership with Cypress Semiconductor, Intel, and Qualcomm began pilot production of its 3D Si anode Li-ion battery technology in 2014 for the mobile products/wearable devices market. Sila is qualifying its Si-based anode cells for use in various consumer electronic devices starting as soon as the end of this year or early next. As improvements to Li-ion anodes continue to boost performance, users can expect to find their mobile devices getting smaller, smarter, charging faster, and lasting longer, while more affordable electric vehicles will offer better acceleration, longer range, and improved performance even in colder conditions.